« Bowling Ball + Idiots In Car = Awesome-O! The above is from my favorite, and probably everyone else as well, webcomic called Penny Arcade. In the short series titled Undisclosed Propensities, Gabe is embroilled in a line dancing fiasco that when push comes to shove, he has to reach deep down to pull off the one and only Dixie Twist. Although most assumed this type of precarious maneuver confined to webcomica, it turns out it is not. 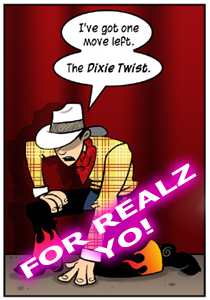 All behold that which is the real life Dixie Twist. This entry was posted on March 29, 2007 at 10:17 am and is filed under Humor, Online, Video, Webcomics. You can subscribe via RSS 2.0 feed to this post's comments. You can comment below, or link to this permanent URL from your own site.